Karen Woodward: NaNoWriMo: Why write a 50,000 word manuscript in a month? 2. It's just what the doctor ordered. You know that manuscript? The sick one? The one you've been meaning to make some chicken soup for, take to ER, and rub its back till it feels better? NaNo gives you a whole month to indulge the headachy, snot-filled, fever-ridden work-in-progress. After 30 days of caregiving, you'll know beyond the shadow of a doubt whether or not the patient can be saved. 3. It will force you to look at things from a new vantage point. With NaNo, there's precious little time for second-guessing. Or editing. Or proofreading, for that matter. It's a write-like-your-life-depends-upon-it undertaking. Which makes you overlook things that may have slowed you down in the past. Every new NaNo day marks uncharted territory. There is no time to revisit what you did yesterday. Get ready to be bumped out of your comfort zone! 4. Try something daring. Has your writing become rote? Complacent? ~ahem~ By-the-book (pardon the pun)? NaNo gives you permission to throw away your crutches and safety nets. Try something you'd never normally do. Go ahead: it won't kill you! 5. You discover your personal writer's work ethic. No matter how supportive your cheerleaders, no one can write your book for you. (Technically, that's not true. Ghostwriters can. But that kind of negates the whole "I'm going to write a novel this month" thing...) NaNo shows you exactly what it takes to shoulder the book-writing load and git 'r done. Sounds good to me! 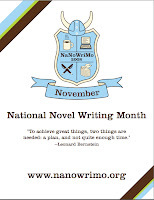 :) Read the entire post here: Top 5 Reasons You Should Do NaNoWriMo This Year. The original post has wonderful photos; I love the one of the dog trying to eat water. Not sure about NaNoWriMo. I was psyched to try it back at the beginning of summer, but for some reason, I just can't get back that enthusiasm. Weird, but even though I've written far more than 50,000 words in a month before, the idea of tackling NaNoWriMo intimidates me. It feels almost like I'm setting myself up to be judged and that somehow, I would inevitably fail. I have many excuses, and at the moment, they trump all else.